I’ve taken a little time off from talking about the Boys’ Bedroom Makeover so if you’ve forgotten or missed them before, here are the links to some of the transformations that took place. Anyway, I thought I’d fill you in on some other projects that went into making the room what it is today. 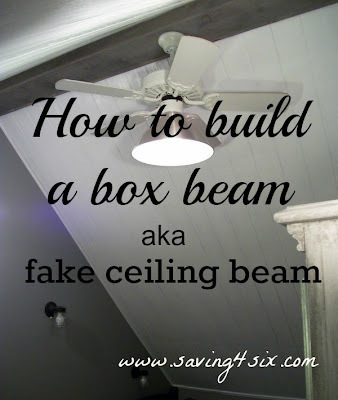 One of my favorite features is this faux ceiling beam. I have enlisted My Better Half to write the rest of this post. He will do a much better job describing the building process. In order to build the faux beam (aka box beam) we needed to construct the skeleton. We determined the total ceiling length in the room and knew it needed to be be about 1/2″ short to allow us some wiggle room when installing. The framework was made using 2 cedar 1x4x10’s with 2x4x8″ supports to make it rigid…and give something to attach the cedar bottom to. The parts were fastened together with brads (finish nails) and construction adhesive. There were horizontal “scabs” added to align with the ceiling trusses which would make a good, solid anchor to the structure of the house. Initially, the cedar lumber was ripped (cut lengthwise) to 2 4 inch pieces and one 8 inch plank. We used a weathered gray stain to cover the outside of the 2 smaller planks and the larger 8 inch beam, and after drying for a short while, the frame was taken indoors to install. The framework was lifted into place, the side planks were made plumb, and the frame was finally set in place. It was attached to the trusses with plenty of 4″ screws. The wiring for the fan/light was routed to its position, and we bored a hole in the bottom of the main cedar plank for the fan wiring, and it was installed using construction adhesive and brads. The wiring was fished through and we installed the fan…but we will save that for another post! It turned out great Carrie! I love this. What a fun weekend project. Thanks for linking up. I just shared it over on Facebook and I am pinning it too! adjustements would really make my blog shine. Please let me know where you got your design. Moreover, several overseas Pakistanis have also obtained the citizenship of North America and Europe. It means, you can make call to Pakistan by using your PC, laptop or smartphone. You can go for a franchise of any renowned computer company such as Data Doctors.